The timing of flowering plants and migrating birds matters. Migrating hummingbirds depend on flowers as a food source, and flowering plants depend on birds for pollination. When the timing of these events is mismatched, as in years with anomalously early springs where the plants flower before the birds arrive, both the plants and the birds can suffer. Mismatches such as this can markedly impact population sizes.As the lilac and deciduous tree results above indicate, plant species leafed out and flowered many weeks earlier in 2012 than in 2011 across much of the U.S., in response to the remarkably early warm spring temperatures in 2012. We were curious to know, were hummingbirds also being affected by the anomalously warm spring of 2012? The graph above compares the dates that active individuals of ruby-throated hummingbirds were first observed in spring 2011 and 2012 across the United States. There were more observations reported in 2012 than in 2011, but there was no significant difference in arrival dates between the two years. These results suggest that the early warm temperatures of 2012 had little influence on ruby-throated hummingbird migration. This is likely because hummingbirds spend the winter months in southern Mexico and Central America. They are believed to be cued to migrate north by an increase in day length, signaling the start of spring. As this cue occurs at the same time each year, their spring arrival in North America generally doesn’t fluctuate that much from year to year. 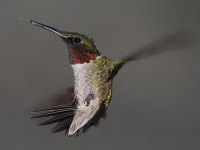 It is believed that species that migrate the farthest, such as hummingbirds, have the least capacity to adjust the timing of their arrival in the north, and therefore may be the most impacted by the advancement of spring. Observations on migrating species such as hummingbirds can help us better understand how these species are responding to the year-to-year fluctuations in climate.